Launch Point 1 (2.9 miles from Ortega Hwy) works best in NE wind. 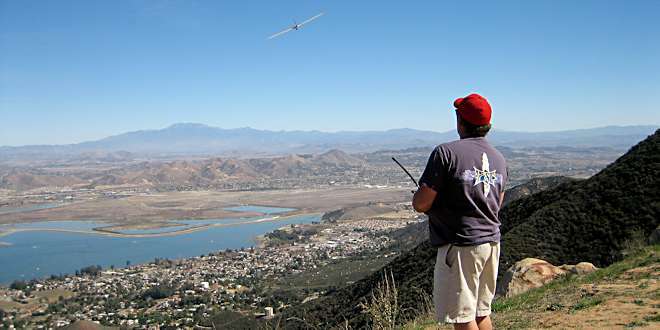 Launch Point 2 (4 miles from Ortega Hwy) works best in ENE wind. Other places along ridgeline should be flyable in winds ranging from N to E. There are also some sites on the opposite side of the road with potential for good flying in SW winds. ECSC1 El Cariso (MesoWest), Helipad near junction of Main Divide Rd. & Ortega Hwy. SDLEL Lake Elsinore, (MesoWest), Lake level, NW end of the lake. SDWDM Wildomar (MesoWest), Lake level, 4.8 mi. SE of the lake. Steep slope rises 1500+ feet in 1 mile. Monster lift in Santa Ana Wind conditions. Paved road going SE from Ortega Hwy follows ridgeline to several flying sites overlooking large bowls. Park and fly! Landing options range from poor to acceptable. Go South (up the mountain) on SR-74 for 5.1 miles to South Main Divide Rd. and turn LEFT. Go East on SR-74 for 23.3 miles to South Main Divide Rd. and turn Right. Go SW on South Main Divide Rd. aprox. 2.9 miles to Launch Point 1 and 4 miles to and Launch Point 2. These are only 2 of many possible flying sites along South Main Divide Rd. 33.65215, -117.40899 • Junction of SR-74 and South Main Divide Rd. 33.63839, -117.38738 • First of many possible flying sites.